The characters you loved in Hot Chocolate are back with more escapades of life in Houston’s wealthy River Oaks. Lila Mae is in a tizzy over the Chocolate Ball – a huge event that she and her sisters, Dorothea and Madge, host every year. But due to unusual circumstances, Dorothea and Madge dump everything in Lila Mae’s lap. If it weren’t for Julian Gillespie of Event Is King, the Chocolate Ball would have melted. Bernie, the Alcott sisters’ 92-year old father, decides he wants his Bentley back. The sisters and Bambi are horrified. They hire Joseph’s cousin Chewie as Bernie’s new chauffeur. Wolfram, Lila Mae’s new astrologer, gives clues of things to come. This leaves Lila Mae and her sidekick Amelia with brows furrowed. On her day off, Amelia decides to bake a chocolate blueberry pie. She discovers she needs to make a grocery run. When she returns home, she discovers her kitchen door is slightly ajar. Arms loaded with groceries, she toes the door open. Three things catch her attention: a vase of flowers on the kitchen island that was not there when she left the house, her marble rolling pin covered with blood… and a dead body on her kitchen floor. Amelia’s eyes drift toward the dining room and beyond – is the house empty, or is there a murderer in the house? She backs up, turns and hurries outside. After setting the bags on the ground, she slips back into the kitchen and snaps a picture of the dead guy. Then she calls Detective Chance Walker, Lila Mae and finally… 9-1-1. I loved the first book in this series, Hot Chocolate, so I’m not surprised that I loved this book too. The sisters are hilarious, and I love that they’re still so close at their ages. I love their individual personalities, and how they interact with each other. The book is written extremely well. There is just enough going on so you don’t get bored, but not enough to overwhelm you. The secondary characters are as interesting as the Alcott family and together they keep the book going at a nice flow. Like the first book, I had no idea who dunnit. I was very surprised when I found out who it was. For me, that’s what makes books like this so good. It’s no fun reading a murder mystery if you’ve figured out who the murderer is. I loved that Dorothea is expecting at her age! She’s 55 and has two kids in college! Plus she’s expecting twins! Better her than me LOL! I hear there’s going to be a third book in the Alcott Family Adventures series, and that makes me very happy. I can’t wait to read it too! Dawn Ireland is the CEO of Artistic Origins Inc, a 100% woman-owned publishing and technical writing service company that has been doing business since 1995. She’s an award winning independent publisher and author of The Puppy Baby Book, Mastering Your Money, and Amazon Best Seller Hot Chocolate (the first in the series, and her fifth novel). The Hot Chocolate audio book was awarded the AudioFile Earphones Award on Valentine’s Day 2014. Her family feature film screenplay A Girl and Her Dog was awarded a Kids First! Endorsement by the Coalition for Quality Children’s Media in October 2012 and optioned by Shadow Cave Productions in February 2013. Originally from Feeding Hills, MA, Dawn migrated to San Antonio in 1968, then when her first son was one years old, her family moved to Houston where work was more plentiful. After 40+ years of heat and humidity, she has her sights on the Pacific NW. Dawn is the co-author of the animated screenplay Memoirs of a Dog which won the Spirit Award of the Moondance Film Festival (children’s category) September 2011. Her dark comedy Plan B was a finalist in the Table Read My Screenplay script competition in 2010 and years before that, Standing Dead won the Women in Film and Television (Houston Chapter) screenplay award. Stay tuned for The Last Dog (futuristic/sci-fi 2015), and Spicy Chocolate (2016). Thanks for taking part in the tour. 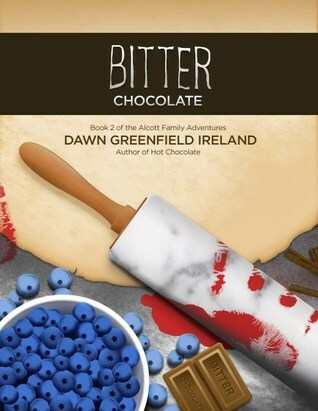 I’m so glad you loved ‘Bitter Chocolate’! I havent yet, but the series sounds great!